A group of BVSc I veterinary students is hosting the Run 4 Rhinos event at the LC de Villiers sports grounds on 28 July to raise awareness and funds for the RhODIS™ project of the Faculty of Veterinary Science’s Veterinary Genetics Laboratory (VGL). In order to help with the plight of the rhinos, the lab is collecting DNA samples of rhinos across the country to create a database using the unique DNA profile of individual rhinos. So far, the database has grown to include over 3500 black and white rhinos from South Africa in just over a year. An official 5km and 10km fun run/walk will form part of the event that will take place at the LC de Villiers sports grounds of the University of Pretoria, while a life-sized fibre glass rhino with a slot hole (built with the financial assistance of Wildlife Pharmaceuticals) will be officially introduced as the ‘piggy-bank’ for the project. Various food and other stalls will be erected on the grounds and the day promises to be a fun-filled event for a great cause. All the money raised by Run4Rhinos will be donated to the RhODIS™ programme which is run by the Veterinary Genetics Laboratory (VGL) at the Onderstepoort Campus of the University of Pretoria. It costs about R600 for each rhino to be added to the database (excluding darting and sample collection costs). 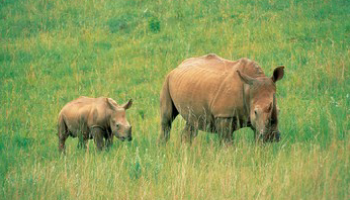 The goal of the VGL, managed by Dr Cindy Harper, is to include all rhinos on the system. This will deter poachers and assist in forensic prosecutions. One of the other sponsors of the day, PPS (the Professional Provident Society) has in the meantime pledged to not only donate R10 000 to the cause but has agreed to pay an additional R5 to the RhODIS™ project / VGL for every participant that completes the 5km fun run or 10km race wearing the PPS/Rhino shirt. For more information please go to the Run-4-Rhinos Facebook page.